How can I reuse or recycle cheap novelty wigs? | How can I recycle this? How can I reuse or recycle cheap novelty wigs? Loads of people will be wigging out tonight in honour of Halloween but by the end of the evening, their wigs will be somewhat worse for wear. Cheap novelty wigs aren’t really made to be used again and again, and have a tendency to shed all over the place when brushed or washed. But what else could be done with them? Curly ones would probably lend themselves better to used as stuffing – since they’re bouncier – so that’s one thing. What else? How can I reuse or recycle things to a make a Halloween costume? 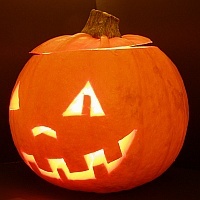 How can I reuse or recycle post-Jack-o’-lantern pumpkins? Not a post but just a FYI: we scooped out our pumpkin last night, made pumpkin & ginger soup with the innards and are drying the seeds. John’s going to carve a spooky masterpiece into the shell this afternoon then once we’re done being all together ooky, I’m going to use it to make a couple of bird feeders. Hurrah for Halloween! Actually, spreading fabric glue on the inside of the wig can keep the hair on. But if the wig is already noticeably balding and the hair isn’t too short, one can make falls and such by gluing or sewing sections of the hair together and cutting them off the wig. My grandmother used to put old wigs in her fruit trees to scare away the birds. Scarecrow for next Halloween? Play clothes for kids? 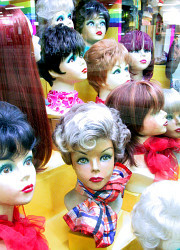 What about donating the wigs for women who are undergoing cancer treatment? At least the ones that are in basic colors. At my old school once, we had a dress-up-as-if-you-played-a-sport day. A friend of mine went as a cheerleader and used a couple of old sparkly wigs as pompoms. Not really great for everyone, but you could give them to an eight year old’s dressing up supplies. On a more useful note, you could use strands to tie things up, maybe line a birdhouse with a real style hair one?